In a large sheet pan, toss cauliflower florets with 3 tablespoons olive oil, salt, pepper, and garlic powder until combined. Arrange everything in a single layer. If pan is too crowded, use 2 sheet pans. Roast in oven for 25-30 minutes, turning once, until golden brown and fragrant. 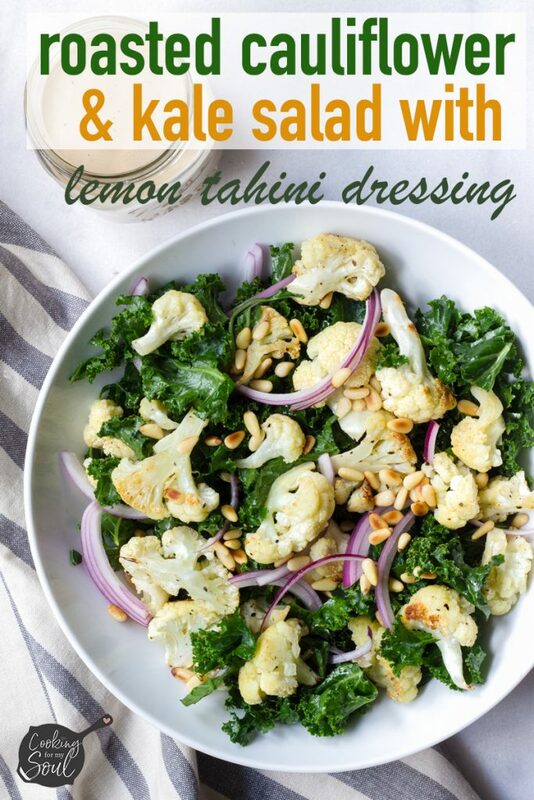 Make the Lemon Tahini Dressing: combine all lemon tahini dressing ingredients in a mason jar. Shake well until well-combined. If too thick, add more water until desired consistency. Heat a small skillet to medium high heat. Toast the pine nuts until golden brown, tossing occasionally so they don't get burnt.